1 milonga in Caldas da Felgueira in the state/province of Felgueira. 8 milongas in LISBOA in the state/province of Lisboa. 13 milongas in Lisbon in the state/province of Lisbon. 1 milonga in Portimao in the state/province of Algarve. 14 milongas in Porto in the state/province of Porto. Comments (transportation, music, ...) Pasiontango�s tango weekend in northern part of Portugal. Ckeck the date on facebook page. Located Dawn Town, in the Historic City Center. Comments (transportation, music, ...) Milonga La Bella takes place on the 2nd and the 4th Thursdays of the month. Comments (transportation, music, ...) Milonga La Bohemia is monthly on the last friday of the month. Best transport by bus 742 or taxi. Esta Neolonga Mix, musicalizada por Ruben Dias, vai ao encontro do gosto de todos os dançarinos de Tango Argentino. Os convites de dança poderão ser de revés, ou seja os Followers também poderão convidar os Liders. A escolha musical será de 30% das clássicos ( Milonga, Canyengue, Vals e Sallon) e 70% de Nuevo Tango. Comments (transportation, music, ...) 3th SATURDAY of the MONTH !!! At the Caixa Econ�mica Oper�ria in Gra�a, on the opposite side of the street to Voz do Oper�rio! 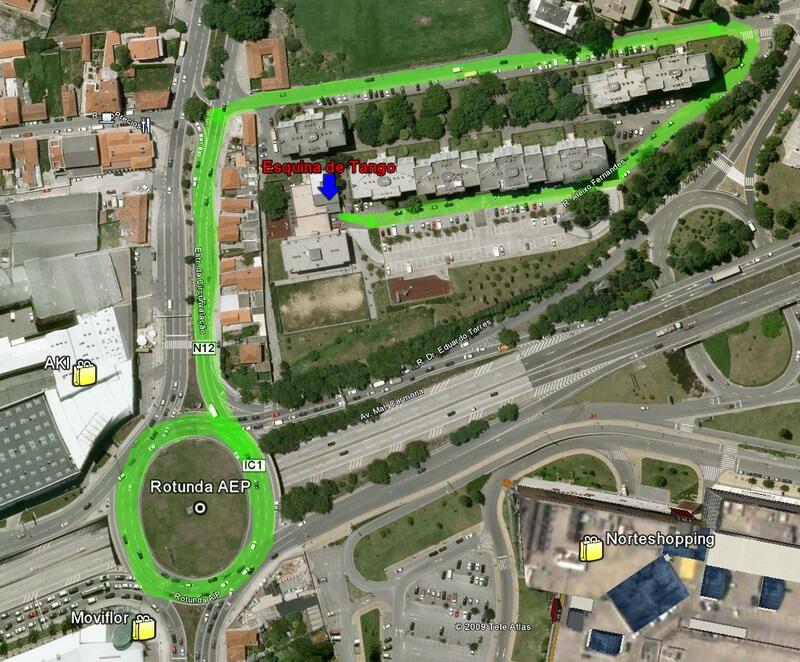 Parking spaces nearby, either up the hill in Largo da Gra�a or down the hill by Feira da Ladra. Na Caixa Economica Operaria na Graca, no lado da rua oposto a� Voz do Operario! Todos os 3�s sabados de todos os meses das 22h30 ate 4h!!! Lugar para estacionar na mesma rua, no largo da Graca ou 400m abaixo, na feira da Ladra. First Tango reference in Lisbon. and guest dancers Sabrina Gonzalez, Solange Galvao, Luciana Cardoso, Ver�nica Olivera, Mirta Tiseyra, Analia Malgarini, Andrea Uchitel, Joana Ramirez. Organizer's name A Todo Tango! Comments (transportation, music, ...) Come and enjoy your Tango in a relaxed and friendly environment! With good traditional music, an impeccable wooden floor, surrounded by friends, all the conditions for a great Tango evening are set and ready! Comments (transportation, music, ...) Weekly Milonga, happening in different places, namely open air venues. Comments (transportation, music, ...) Third thursday of the month. Comments (transportation, music, ...) "Milonga in Chapito" organized by tango school Pasiontango, is a monthly event that happens every last Thursdays of the month. Comments (transportation, music, ...) Weekly practica, every saturday from 19:00h to 20:00h. Comments (transportation, music, ...) Come and discover the magic of TANGO at the Castelo de S. Jorge on the first Saturday of every month between June and September. Try out a class with Argentinian teacher MIRIAM NIELI and dare to do MILONGA to the sound of music by ANUNAMANTA, a project that began in Argentina and comes from the fusion of various cultures �� Joana Ruival (Portugal, voice, guitar, percussion), Elena Marcigot (Italy, clarinet, tenor saxophone, percussion and voice), Daniel Pacheco (Argentina, guitar) and André Zambi (Brazil, guitar and mandolin). Tradicional and friendly Milonga where the "milonga códigos" are respected as well as the "líneas de baile". The dancing invitation is made with mirada and cabeceo. Comments (transportation, music, ...) Milonga de Portimão uma vez por mês ,sempre ao 4º Sábado de cada mês. Comments (transportation, music, ...) Please visit out website for exact dates and times of Milongas, under the tab "Not�cias". We play traditional the best Tango, Kizomba, Salsa, Milonga and Vals. If you're visiting Portugal you definitely have to come dance with the best, join us! We have subway 5 min of walking distance. Milonga's name Noche de Tango! Comments (transportation, music, ...) Last Wednesday of every month. * musical selection organizaded by "tandas" with "cortinas". Welcome to all "milongueros" willing to embrace this new proposal with us :-) ! Comments (transportation, music, ...) La Milonga Argentina mas antigua del Norte de Portugal. Organizada por los Maestros Argentinos GLADYS y OSCAR. Comments (transportation, music, ...) In the center of City, OPORTO.